Award-winning Chesterfield company Thermotex has a new engineer – thanks to its boss taking the time to mentor students. 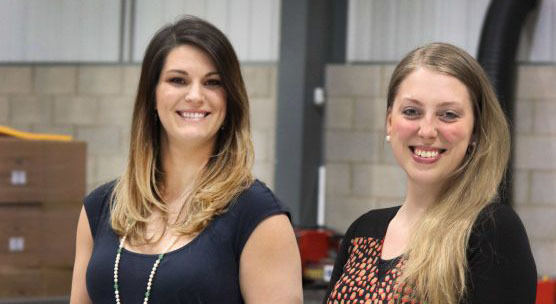 Paige Niehues, 27, has joined the thermal solutions specialist as Commercial and Technical Executive after MD Chloe Watmore was asked by the University of Sheffield to set a real-time challenge for its Management School to tackle. The project was an all-round success. Students on the international module of their MBA gained invaluable experience. The award-winning 24-year-old company custom-designs high-performance insulation jackets and heat tracing systems relied on for temperature control by companies around the globe – from oil and gas refineries in the Arctic Circle to international construction companies and UK chocolate factories. Said Chloe: “The Management School invited me to bring a live business issue to students. We have exported for many years, but we want to establish new overseas markets and asked four groups of students to research this and come up with strategies. I was really impressed and developed a company strategy which merged all four. “Paige was in one of the groups. She reached out to me while working on her dissertation on the digitalisation of manufacturing, which Thermotex is heavily invested in. Chloe joined the company her parents founded in 1995 as a 20-year-old Economics graduate. She revolutionised factory processes, grew international trade and led the company to record growth. Chloe has now asked this year’s students to assist Thermotex in expanding its manufacturing presence overseas. New recruit Paige began her career in Houston as a product design engineer with a large oil and gas company. She moved to the UK after meeting her future husband at her employers’ manufacturing plant in Leeds and enrolled at the University of Sheffield to study for a Masters in 2017.